Babcock Marine is a subsidiary of Babcock International Group PLC based in Rosyth, Fife. The company specialises in support and engineering services for the Royal Navy. Babcock required the construction of a new 4000m2 concrete hard-standing within the Rosyth Naval Base to store large temporary structures, plant and equipment for the UK’s aircraft-carrier projects. The project is located adjacent to the former nuclear submarine facility and was seen as critical to the core aircraft-carrier programme. The works required a knowledge of working to the Ministry Of Defence’s stringent requirements and included a an expertise in dealing with a demanding structural concrete slab specification, incorporating under-slab drainage and services requirements. 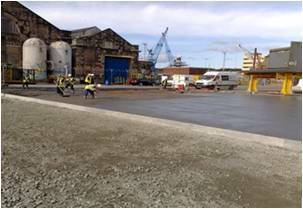 Colorado Construction has extensive experience in working with the MOD and within the Rosyth Naval Base and was well placed to assist Babcock in addressing the location’s complex underground services in the dockyard and the MOD’s environmental requirements. Colorado took on board the specific requirements of the project and added to the project delivery incorporating the recycling of existing materials, value engineering the overall project works while ensuring a structural concrete slab finish to the Babcock exact specifications.